It's the oldest capital city in the Americas, rich in history and culture, and a major economic center in the region today. In addition to Aztec ruins, the city has the world's largest single metropolitan concentration of museums, plus extensive art galleries, concert halls and theaters. And the city's 16 boroughs and many colorful neighborhoods offer an abundance of shopping, restaurants, bars and nightlife. A trip there may be more doable than you think. According to travel site Skyscanner, there are plenty of flights from San Francisco to Mexico City in the next few months, and the prices aren't too shabby. The cheapest flights between San Francisco and Mexico City are if you leave on Feb. 25 and return from Mexico on March 1. West Wind ExpressAir currently has roundtrip, nonstop tickets for $293. There are also deals to be had earlier in February. If you fly out of San Francisco on Feb. 2 and return from Mexico City on Feb. 5, Air New Zealand can get you there and back for $370 roundtrip. Regarding where to stay, here are a couple of Mexico City's top-rated hotels, according to Skyscanner, that we selected based on price, proximity to things to do and customer satisfaction. If you're looking to splurge on top quality, consider The St. Regis Mexico City. The hotel has a five-star rating on Skyscanner, and rooms are currently available for $255. "This tranquil little place serves delicious and crispy churros that are best eaten dipped in a hot chocolate sauce," wrote reviewer Claudia. Not sure what to do in Mexico City, besides eat and drink? Here are a few recommendations, provided by Skyscanner. The top-rated visitor attraction in Mexico City, according to Skyscanner, is Callejon Regina. "This is my favorite street in all of Mexico City," wrote visitor Jenny. "It's in the area of the historical center, and there are endless restaurants, cafes and bars to choose from all along the street. It's also a great place to sit and people watch the artsy and eclectic people of Mexico City." Another popular destination is the Kiosco Morisco de Santa Maria la Ribera, an elaborately designed steel kiosk. 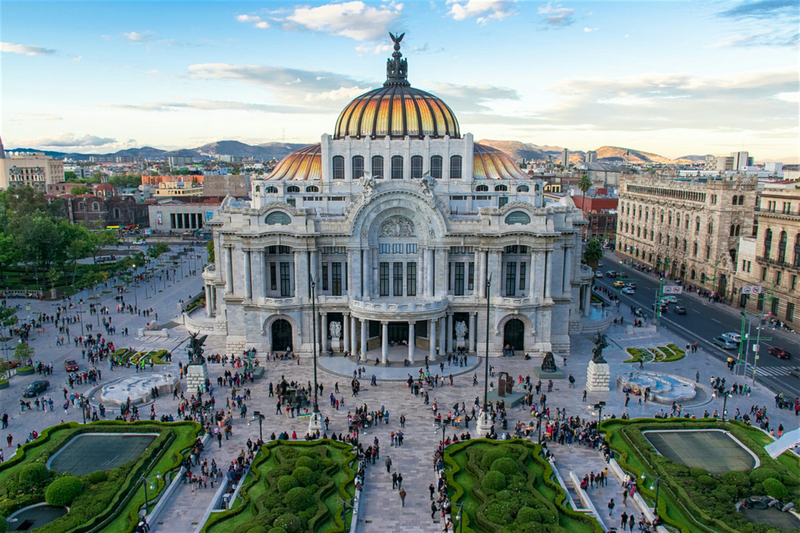 Finally, consider checking out The Palacio de Bellas Artes.